Drywall panels don't have to exhibit the same drab and smooth surface they usually do. One of the main advantages of this material is its versatility and customizability. With the right finish and texture, it can look like anything from a classical red brick wall to the wood wall of a log cabin. The choices are limited to nothing but your imagination. Our team at Drywall Repair & Remodeling Simi Valley can take of everything else. Drywall texture can be divided into two categories: hand applied and spray applied. The need to texture a wall or a ceiling stems from the aim to disguise imperfections or to create a unique look and give the indoor part of your home or commercial property a special appeal. It is important to note, however, that texturing can't hide major imperfections. It is necessary for the drywall to be properly finished and smoothened out before the tactile layer is applied. This also means covering the nails and seams with mud (joint compound) and tape. Drywall textures that are applied by hand are more easily influenced by the builder’s imagination. Some are applied using a knife and a pan, or a trowel and a hawk. Special brushes can also be used to swirl or stomp patterns in the mud. In some cases, paint roller or paint sprayer can also be used. Different texture styles can be produced by different experts, even if they use a similar technique. Skip, Santa Fe and rosebud are some of the different texture styles that are quite popular today. The double skip and the stomp knockdown are other common styles that builders love to use. The diversity is broad, as skip trowel alone can refer to various different styles. The real one is applied using a special knife that is about 10-18 inch in size. 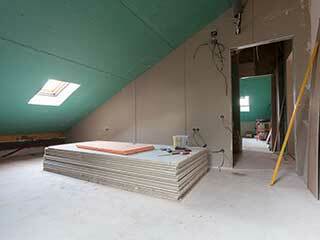 Mud is thinly applied at an angle that causes it to skip across the surface of the plasterboard. It can be identified by round circles spread across the sheetrock. This is different from the hawk and trowel style, which results in straight lines and textures layered over one another. Santa Fe, on the other hand, consists of two smooth layers: the top one allows the lower layer to appear through in some areas. Drywall texture sprayers come in various brands, sizes, and shapes. The material is pumped through a hose, and the pump may be just a diaphragm type, powered by an air compressor or a more complex one that uses an electric motor. Larger rigs use diesel or gas motors. Three common spray-applied texture styles are popcorn, splatter knockdown, and orange peel. The latter is the most basic and common method used today. Splatter sizes can vary quite significantly, depending on the orifice size of the sprayer or the air pressure involved. Knockdown texture is essentially a modified version of the orange peel, while the popcorn style has styrofoam chips that look like watery oatmeal. Our drywall installation experts will be happy to present you with various texture styles that will best suit the design of your property. Reach out to us today to learn exactly what we can offer you.